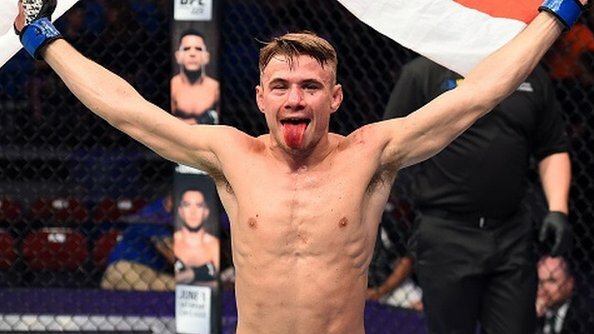 British bantamweight Nathaniel Wood will face France’s Tom Duquesnoy at UFC 232 in Las Vegas on 29 December. Wood, 25, impressed on his UFC debut in June when he beat Johnny Eduardo with a second-round submission in New York and was awarded Performance of the Night. The Londoner, nicknamed ‘the Prospect’, says he wants to “put on a show” in Las Vegas at the T-Mobile Arena. “Vegas is the capital of the fight game, so I am excited to showcase my skills out there,” Wood told BBC Sport. “Expect a fast-paced fight. I don’t like to go to decisions, I like to get it finished and get those bonuses. Wood, who is mentored by UFC veteran Brad Pickett, hopes to climb into his division’s top 10 fighters next year. “The end goal is to become UFC champion, get that gold around my waist, and live a happy life,” added Wood. “I am living the dream at the moment. The former Cage Warriors champion also has eyes on competing in front of his home fans in the English capital. “For me, the dream place to fight is London,” said Wood. “I want to fight in my home town. Pickett says a fight between Wood and Duquesnoy may have happened earlier, before ‘Fire Kid’ was signed to UFC – the Frenchman has won two of his three bouts since. Wood’s performance on his UFC debut in June earned him an extra $50,000 (£38,100) for winning the Performance of the Night prize. “I was laying in bed, I was with my dad and had a bit of concussion, I was being sick and was in a real bad way after the fight,” he said. “I fell asleep, woke back up about two in the morning and we were just looking back on the fight when the bonus came up – it had 50Gs next to my name, I’ve never had that much money in my life. And Wood, whose professional record stands at 14 wins and three losses, says he feels at home at mixed martial arts’ top table. “I have been visualising it and training for it for the last 10 years of my life,” he added. “When I was walking into the cage it felt normal, it wasn’t until after the fight when I looked backed on the TV that it felt weird, but it felt good. World Cup 2018: Is Kylian Mbappe the new Pele? July 5, 2018 sportseditor Comments Off on World Cup 2018: Is Kylian Mbappe the new Pele?